At Market Lavington Museum we work with a local metal detecting person. Metal detecting can get a bad press but by working with ‘our’ man we get the benefit of knowing what has been found and, importantly, just where it was found. We can photograph all of the finds and some can end up on display in the museum. 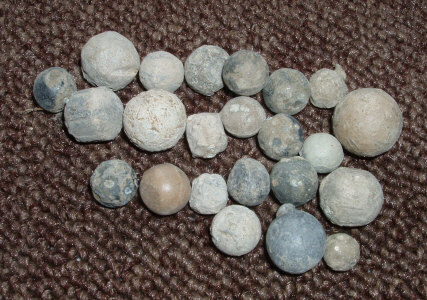 These are thought to be lead musket balls, all found within the parish boundaries. Apparently this represents a fairly normal level of find and does not suggest that the Market Lavington folk were warlike in any way. Many of the finds are interesting, pretty even, but of no cash value. Here we have a decorative button. Nothing is known about it. Perhaps you could help. Can you help identify this metal button? 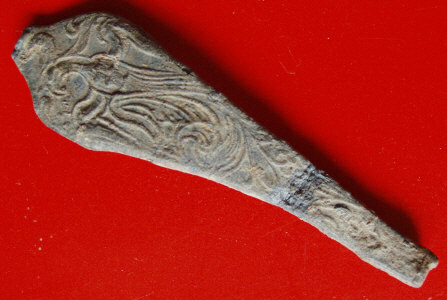 Somebody has helped with this spoon handle so we know it is made of lead alloy and dates from between 1650 and 1750. There will be a photographic display of many more metal detector finds in the museum during the 2010 season. This entry was posted on January 25, 2010 at 7:33 pm and is filed under Museum. You can follow any responses to this entry through the RSS 2.0 feed. You can leave a response, or trackback from your own site. I live in central England Near Kenilworth in Warwickshire… and I have found a button (with my metal detector) in my back garden, very similar to the one your asking for help in identifying on your website… its quite large, almost one and half inches across with very similar design to yours, but with the side view of a mans face in between the central pattern and he frilly edge… its non ferrous, so I presume its made of bronze.